CEO Brian Krzanich teased the Windows 10-powered open source VR headset Project Alloy from the stage of the annual Intel Developer Forum earlier this week and now, from this same stage has the launch of Joule been made, dubbed “Intel’s most powerful developer kit yet”. We assume that Joule was named after James Prescott Joule, following the previous line of Intel products: Edison, Galileo, and Curie. 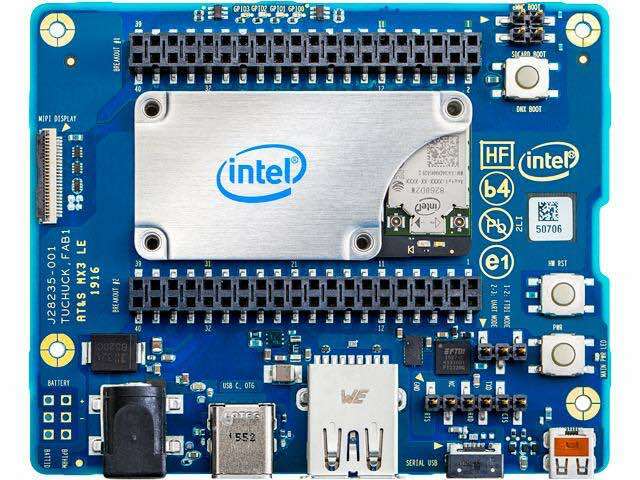 Intel Joule is a high-performance system-on-module (SOM) in a tiny, low-power package thus making it ideal for computer vision, robotics, drones, industrial IoT, VR, AR, micro-servers and other applications that require high-end edge computing. Joule is Intel’s latest brand new 4-core embedded module boasting ith a small size of 48 x 24 x 3.5 mm. It houses an Intel Atom quad-core processor that runs at the speed of 1.7GHz and 4GB RAM. It also houses an integrated HDMI GPU graphics and USB ports for keyboard and mouse connection. The features don’t end there – this mini-computer also features Intel’s RealSense depth-sensing camera which allows its developers create well advanced IoT (Internet of Things) devices that will be able to capture depth-of-field information – giving the IoT device the ability to make decisions on its own. Joule has support for both Linux flavors and Windows 10 just like the popular hacker board Raspberry Pi 3. Intel Joule is affordable and compact enough to be used in deployment, therefore Ubuntu Core can be installed to make any device it’s included in secure and up to date. You can visit Intel’s website if you are interested in getting more information. If you’re interested in laying your ahnds on a Joule so that you can make your advanced IoT dreams come through then feel free to visit Newegg.